On a foggy day in September 2013, 23-year-old Dawa Yangzum Sherpa pulled her crampons tight against the bottom of her boots, taking care to tuck in the loose ends of the straps. She buckled a helmet over her long dark hair and swung her pack onto her shoulders. It was dry season in Nepal, and conditions were calm on the Langshisha Glacier, located in the upper Langtang Valley. The glacier, which sits below the sharp ridges of 21,086-foot Langshisha Ri, was about 45 miles as the crow flies from where Dawa Yangzum grew up. Four stern-faced examiners from the Nepal National Mountain Guide Association positioned themselves across the glacier and watched as Dawa Yangzum tied herself into the end of a rope, coiled the excess around her torso, and secured the other end to her client’s harness. She curled her fingers around her ice axe, took a deep breath, and started walking. 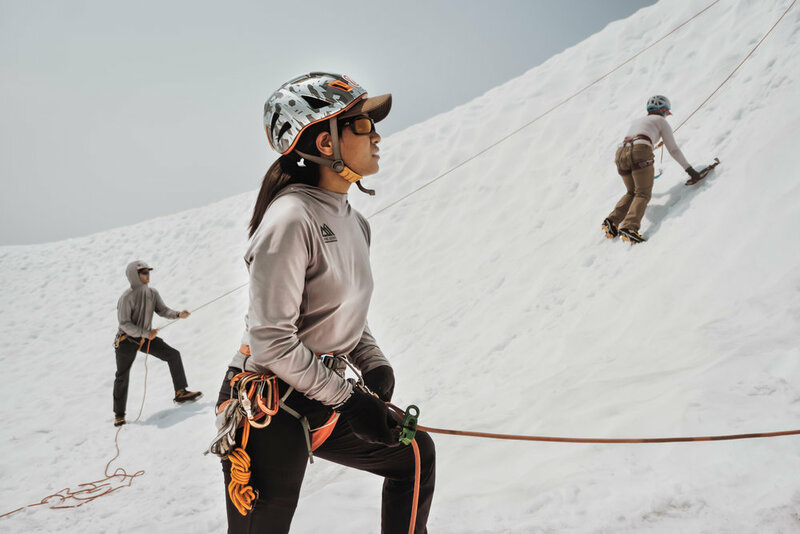 She had 30 minutes to guide her client safely along a route that traversed the glacier’s icefall, skirted crevasses, and descended 30 feet down a sheer face. If the client slipped, she would use the axe to arrest his fall. The stakes were high: By passing this test, Dawa Yangzum, who’d already summited some of the world’s highest peaks, including Everest, would be one step away from becoming the first Nepalese woman to earn a certification from the International Federation of Mountain Guides Associations.